This beautifully written historical fiction children’s book is quite hard to put down. 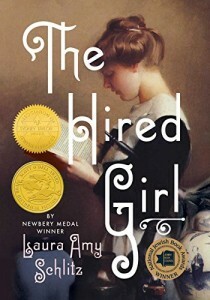 The dramatic voice of a 14-year-old, who now has to pretend to be 18 in order to work as a hired girl, is filled with the passions and emotions of any teenager today. However, the setting, in 1911, creates a distance that allows us to cut her some slack, as she perhaps overdramatizes both the difficulties and her romanticism. I’d like to say this is for all genders, but given it’s vague resemblance to Jane Eyre, it is really a young girl’s children’s book. I wish it didn’t have the predictable girl-falls-in-love-with-master-of-the house! But that’s it’s only drawback. What this children’s book does have is a wonderful depiction of the meeting of two cultures- a rural farm girl with an inclination towards Catholicism, and a sophisticated Jewish city family. Any children with either background, or wanting to learn more about either background, would be well-educated through this historical fiction children’s book. The clashes and challenge of learning mutual understanding and respect toward religion is a wonderful backdrop for a truly heroic story of a girl trying to grow up. I especially loved the use of first-person voice in this children’s book. I felt I lived and breathed with the heroine, suffered her sufferings, and delighted in her joys. The quality of writing in the book is at a level where many adults would also find this book captivating, and well worth reading. I enjoyed the hard-back version, since this large book feels better honored that way.